CFA has begun processing the films of Chicago filmmaker JoAnn Elam (1949-2009), a central figure in the in the history of Chicago’s experimental film community. Due to the superbly generous donation of $5,000 by her sister Susan, we have been able to begin to stabilize this large and complex collection of film materials. 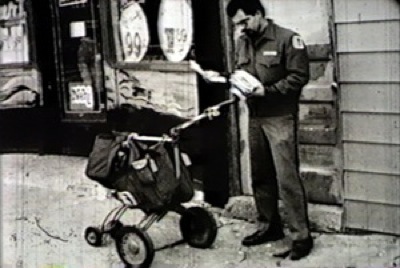 Included in this collection are film elements from a work-in-progress (1979-1990) called EVERYDAY PEOPLE, a film that chronicles her experiences as a postal carrier and the people she met along the way. Susan Elam has become a Preservation Patron of the JoAnn Elam Collection. And this year, Susan Hayes became a Preservation Sponsor of her father’s home movie collection – The Marquis Ritchey Cring Collection. Marquis Cring (born in Belle Center, Ohio) moved to St. Louis to take a job as head of advertising and public relations at the Missouri-Kansas-Texas Railroad. There he met Irene Ellerbeck, another M-K-T employee, and they married and had there first and only child, Susan. Like many other railroad employees who were amateur filmmakers, he often took his camera (and family) when traveling with the railroad to such places as Mexico, the Ozarks, and Galveston, Tx. These films span the mid 1920s through the mid 1950s. One reel even contains footage of Charles Lindbergh at a 1927 Mexico City bullfight that was held in his honor. Also, thanks to Colleen Roberts who is a Preservation Sponsor of the Russ and Sylvia Davis Collection. 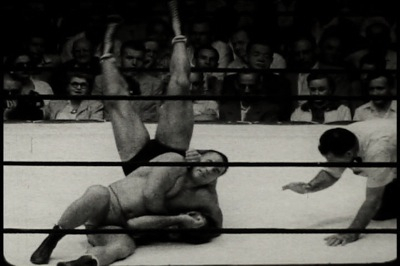 This might be CFA’s most popular collection consisting of almost 200 pro wrestling matches fought in 1950s Chicago. Each match is announced by radio personality Russ Davis who produced these films for Chicago’s first commercial television station WBKB. You, yourself can adopt any CFA collection and be responsible for it’s preservation and archival care. Just go here!